Your favorite band in the world may be awesome to listen to through your headphones, but when you fork over the hard-earned cash to see them live, they just doesn’t match expectations. Some bands, quite frankly, aren’t good to see live. That is certainly not the case with today’s band, who established their reputation not only from great studio work – but also putting on a phenomenal live show. 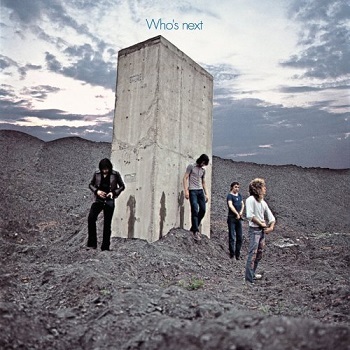 The Who has sold over 100 million records worldwide, and today we focus on their fifth studio release Who’s Next. It was released in August of 1971, considered at the time a cross between hard rock and a rock opera. In fact, this album began as a full-on rock opera entitled ‘Lifehouse’ written by Townshend. After playing a series of concerts to test it out, and flying to New York to record the material, the project was abandoned. The project was too complex and their manager was having a hard time battling his drug addiction. The opera was changed to a studio album sort of by default, which probably couldn’t have worked out any better for the band. If you’ve heard only the major singles off this release, you’d probably be quite surprised to hear what else is on the album. The Who uses synthesizer, prominently on the two biggest tracks, ‘Baba O’Riley’ and ‘Won’t Get Fooled Again’. . Those are two incredible rock anthems, both still seeing major radio play today. And if those are the two tracks you love, the rest of the album is different—quite ballady, with the most popular of the bunch being ‘Behind Blue Eyes.’ It very much still has that opera feel to it, where I think the intention was to go through the highs and lows associated with any sort of story arc. I won’t even go into all the accolades Who’s Next has received—there are too many to count. I’ll add my 5 star-esque review to that list though, and tell you it’s well worth $5 bucks. If you like rock, or even just have a general appreciation of music, this Who’s Next will blow you away. There are maybe only a couple handfuls of albums I have more respect for than this one. And that legendary cover picture, too! One of the best covers in music history, no doubt. Thanks for commenting Chris.